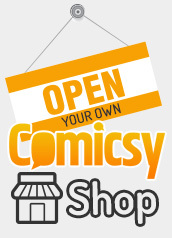 Comicsy is a marketplace for indie comic creators to sell their wares. On this site you will find a whole host of comics and comic related goodies, such as orginal artwork, posters, graphic novels and anything, well…Comicsy. The main Comicsy site (that’s where you are now) displays all the products listed by our sellers. You can browse through these products using the handy menu at the top of every page, or by searching Comicsy for a product in the search bar at the top. Once you’ve found an item you would like to purchase, simply click on the item and you will be taken to that product’s information page. You will now find yourself in the Comicsy Shop of the product’s owner – you will have noticed that the site has changed to reflect the Comicsy Shop you are in. You can now browse or search in that specific shop using the menu on the left hand side of the screen. Don’t worry, you can still see the Comicsy bar at the top of the page should you wish to do a whole site search again. By Mail: When you buy an item on Comicsy, you buy directly from one of our many comic sellers. Simply add items to your cart using the ‘Add to Cart’ button found on every product page. When you’re ready to finalise your sale, view your shopping cart* using the button in the top left of the screen, then click ‘Checkout’. Complete your order and your goods will be shipped directly to you by the seller. Digital Download: These items are purchased by adding them to your shopping cart*. When purchasing a digital download, upon completion of the sale, the seller will email you a copy of your digital download. These are ideal for those who enjoy reading on a tablet. Outbound Link: Many of our sellers have already listed their product on other major websites, such as Lulu or Etsy, or have spent time setting up their own website to sell their goods. When you click ‘Buy Now’ a new window will open taking you directly to their product on the outbound site. You can purchase the item directly from that site. *Please Note: Due to Paypal restrictions you can only include items in your shopping cart from up to 10 different sellers at one time. To buy something you don’t need to register with us but, if you do sign up, you will be able to view your order history, manage your orders, rate a product, and be able to leave comments on the item. Guest buyers (users who do not register or sign in to make their purchase) are not able to leave comments for their orders. Can I buy something from more than one seller? Do I need a Paypal account to buy items listed on Comicsy? How do I cancel my order, return an item, or ask for a refund? I ordered something by mistake, what should I do? Yes, you can add items to your cart from up to 10 different sellers, when you get to checkout you will be asked to confirm your total order and then to pay each seller individually using Paypal. You DO NOT need a Paypal account to purchase an item on Comicsy. We use the Paypal system to securely process transactions, however you are able to safely enter your credit/debit card details into Paypal without signing up for an account. Comicsy is designed to connect small press creators with customers. Any transactions placed on the site are between you and that seller. If you need to cancel an order or to request a refund or replacement, please contact the seller directly in the first instance. You can do this by clicking on the contact link in the left hand menu of each Comicsy Shop or by replying to the order confirmation email you received when you placed your order. If you have not heard from the seller within a few days or if you need further assistance, please contact Comicsy direct. All payments and refunds are processed via Paypal. Each seller sets the postage cost for their own products. They will be different depending on where the items are being shipped, the size and value of the items, and how many items are being sent. The postage costs for all orders will show up in Paypal before you pay so you can see how much they cost in total. If you have any questions about postage, please contact the seller. If you accidently ordered the wrong product please contact the seller as soon as you can to let them know. They can organise a refund or simply cancel the order if it has not been paid for. Please contact the seller as all orders are sent out directly by them. You can do this by clicking on the contact link in the left hand menu of each Comicsy Shop.